Visit the Chargers' official website for your daily fix of team information. It's not easy being a veteran quarterback, unless you're Tom Brady. Coaches and owners haven't been shy about their intentions to possibly target QB replacements in the draft this year. After spending the last four seasons in San Diego, former Chargers linebacker Manti Te'o is on the move to New Orleans. He wasn't the only player to join a new team Tuesday. The Chargers have sniffed around at the possibility of drafting a quarterback this year. Philip Rivers understands that he'll need to play at a high level to keep "this thing going." The Chargers will train at Jack Hammett Sports Complex, which is only about two miles from the planned site of their regular-season base in Costa Mesa, California. The Chargers released veteran tackle King Dunlap, according to Peter Schrager of "Good Morning Football." Are the Bolts finally fixing their problematic offensive line? Left tackle Russell Okung has signed with the Chargers on a four-year, $53 million contract with $13.25 million guaranteed, NFL Network Insider Ian Rapoport reported. The Los Angeles Chargers are parting ways with a trio of players. The team parted ways with Brandon Flowers, D.J. Fluker and Stevie Johnson on Tuesday. Chargers' outside linebacker Melvin Ingram is the latest free agent to be slapped with the franchise tag. Are all of the best pass rushers off the market after Monday's news? New Los Angeles Chargers head coach Anthony Lynn was praised for putting together a good staff, but are there too many cooks in the kitchen? Lynn doesn't think so. Speaking at an awards dinner on Tuesday night, Los Angeles Chargers quarterback says the "only regret I have is not winning it all while we were here" in San Diego. Los Angeles Chargers coach Anthony Lynn knows a thing or two about running backs, and he's eager to help Melvin Gordon take his game "to another level" in 2017. Los Angeles Chargers offensive tackle King Dunlap was arrested on suspicion of violating a protective order in Nashville on Thursday, according to records obtained by NFL.com. 4/15 Trevor Williams (CB) No Offer Sheet Executed (no offer sheet executed). 3/27 Adrian Phillips (DB) Unrestricted Free Agent Signing (unrestricted free agent signing). 3/19 Geremy Davis (WR) Unrestricted Free Agent Signing (unrestricted free agent signing). 3/15 Isaac Rochell (DE) Exclusive Rights Signing (exclusive rights signing). 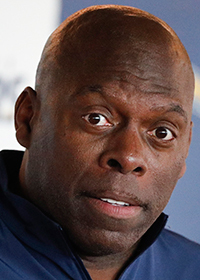 The Los Angeles Chargers hired Anthony Lynn as their head coach on Jan. 13, 2017. Lynn spent the last two seasons (2015-16) with the Buffalo Bills as an assistant head coach and running backs coach. He also served as the interim head coach for the team's final regular-season game. The Bills led the league in both of Lynn's seasons in both rushing yards (2,630 in 2016 and 2,432 in 2015) and rushing touchdowns (29 in 2016 and 19, tie in 2015). Prior to his stint with the Bills, Lynn had assistant coaching stints with the Jaguars, Broncos, Cowboys, Browns and Jets.